The décor speaks of voortrekker days, enamel crockery, quaint bucket lights, food prepared over open fires and old gas cookers. 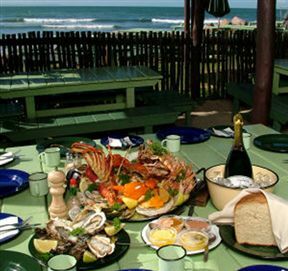 Die Walskipper catches the freshest assortment of seafood prepared succulently and served in the sheltered open-air restaurant. For starters, beguile quail eggs, springbok biltong and droëwors, or oysters on ice. Main courses include old faithfuls as well as adventurous crocodile or ostrich steaks. Get the taste buds tingling with calamari steak, perlemoen, sole, catch of the day and voluptuous seafood platters. Round off the meal with homemade koeksisters, malva pudding cheesecakes, or ice cream with strawberries. Die Walskipper is the perfect spot for a bit of relaxation near the beach, buzzing with culinary activity. Sink your feet into the sand and breathe in the salty sea air at this heart-warming old-style restaurant Die Walskipper. Die Walskipper is 2.1km from the centre of Jeffreys Bay , the nearest airport 78.8km (Port Elizabeth Airport).